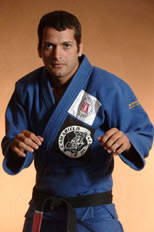 David Camarillo began judo as a young child, training with his father in Bakersfield, CA until the age of 18. Continuing to do judo at Fresno State University, David traveled on several occasions to Japan to train with Olympic and World champion judoka. Getting his start in Jiu-jitsu with Cesar and Ralph Gracie in Pleasant Hill, CA he progressed rapidly and eventually took a teaching position at the Pleasant Hill Gracie Academy as well as joining the infamous San Jose State University judo team. Since that time he has branched out, teaching at several Gracie affiliates that in Northern California as well as at the American Kickboxing Academy in San Jose. Called by the legendary Rickson Gracie, “the most technical American Jiu-Jitsu fighter,” David Camarillo has himself become a legend in modern judo and jiu-jitsu. We are pleased to present the following exclusive interview between David Camarillo and Mokuren Dojo’s Patrick Parker. Dave Camarillo: My strengths as a martial artist coincide with my strengths as a teacher. It all boils down to experience. This is like anything in life. I have trained with some of the best in the world in Judo, Jiu-Jitsu and MMA. I have been exposed to so many styles and have accrued so much knowledge from that experience that it translates into my ability to answer most questions concerning the arts. What makes me a good teacher is that I pay attention to the students in that I look at them individually and cater to their needs. I form a curriculum that covers the basics of the art so that different styles of learning are taken care of by a wide range of training methods. From there I nurture their training by allowing them to explore their own game (style). I am also very free in being an instructor. I allow my students to train where they want when they want. The teacher/student relationship is a reciprocal one. The loyalty goes both ways. If one is loyal while the other is not, it is just a matter of time until that system crumbles, as it did in my previous relationship with my former instructor. I do not believe in ownership of students. An instructor needs to understand that wanting what is best for their students is in their best interest. If a student outgrows an academy, then they need to do the most sensible thing, leave the nest and find the best possible place for their personal and technical growth. I also take into account what art I started with. I come from an intense Judo background. I have trained at some of the best Universities in the United States and Japan. I have competed since the age of eight. And I feel there is no better art to prepare someone for the unpredictable nature of fighting and that of life itself than Judo. It created a mental toughness in me that has proven itself in every aspect of my life. This goes from learning other arts like, Jiu-Jitsu, wrestling and kickboxing to studying anything outside of the arts. It gives me the mental edge and removes the ego from the equation, which creates a more suitable atmosphere for learning. Patrick Parker: What aspects of the martial arts (i.e. physical fitness, self-defense, self-improvement, competition, etc.) do you think you emphasize the most in your teaching? Dave Camarillo: I emphasize the most important (in my opinion). In my next book (Guerrilla Jiu-Jitsu II) I will be talking about the three aspects of training that prepare you for anything. I gained all in my training as a Judoka. The technical conditioning: The ability to accomplish something with attributes as a secondary focus. The Physical conditioning: The ability to push your technique when met with extreme resistance. And Mental Conditioning: The ability to accomplish both for an extended period of time. If a student understands all three then they are on a proper path. It is not good for anyone to understand 2 out of 3 or 1 out of 3. If one wants to reach their full potential (in anything) they will need to understand the three, learn to develop them and apply them at the proper times. Patrick Parker: What was your first experience with martial arts that got you interested in pursuing this path? What do you think most interests your students and keeps them coming to class? 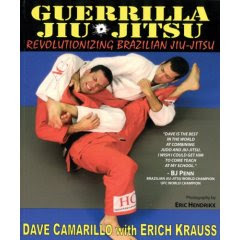 Dave Camarillo: My father was my first sensei. That being said I grew up like the creator of Judo (Jigoro Kano) wanted me too. I was ingrained in Judo as a child. It became a part of my life early on. This is why Martial Arts are so important. If the child has a chance to "choose" their path, they seldom choose what is good for them. They will tend to eat candy all day and play video games. But if they are engulfed in an art from the beginning they will grow up with more than just rotten teeth. They will be great human beings and great citizens of their country. I believe the path to relieve the problems facing our world today starts in the home, and Martial Arts is a great aide to that progress! The reason my students keep coming is a combination of the three most important aspects of the Martial Artists I talked about earlier. They see it as a way of learning great technique (along with honor/respect for their peers). They also see it as a place to become physically and mentally fit. My training methods range from those who first walk in the door to those who have been there for a while. I am known for not just being an instructor but also a coach, and there is a difference. An instructor teaches the technique that is functional for the technical growth of their students. The coach makes them motivated in that process. Which also enhances their mental and physical conditioning. Patrick Parker: I obviously have a big interest in training children. I have two of my kids (aged 6 and 4) in judo already and can't wait to get the rest of them old enough to play with me. Do you think it is better to start kids on the ground, emphasizing newaza and perhaps smaller throws and takedowns, or is it better for the young athlete to emphasize the higher-amplitude ippon judo. Dave Camarillo: Judo is the best art to start with. It is simply understood by what Judo gives you versus its counterpart, namely Jiu-Jitsu. Jiu-Jitsu breeds students who base their fighting ability on technique. That means you will naturally see a major difference in a Judoka and a Jiu-Jitsu practitioner. The difference is a Judoka will be a force, bred to be aggressive with technique as a secondary focus. The Jiu-Jitsu student is bred to look for the easiest ways to accomplish something. This means they will generally be lazier than the latter. Overall: It is easier to build attributes and technique than to rely on technique as a default setting. If a student starts with JJ they will find it much harder to build those attributes to push their technique under extreme circumstances. The Judoka doesn't have the same difficulty in learning the important technique after the fact. It is a mindset that we are talking about. And when someone is bred to be lazy, breaking that spell could possibly be impossible. Patrick Parker: So, do you think coming from a judo background at a young age and then branching out into jiu-jitsu, wrestling, etc… is the best way, or might a child just as well begin in jiu-jitsu then pick up some judo, boxing, etc...? Dave Camarillo: Judo is the ultimate in Martial Arts. It is the toughest art I have ever sampled. It builds character, respect and aggression in its application. I believe it prepares the student for anything. As far as its translation in MMA it is easily adaptable because of how it builds proper coordination. From grip fighting you gain fast and precise movement with your hands arms and legs. In tachi-waza (throwing) you build fast hip movement and extreme core strength. In Ne Waza (ground fighting) you build an aggressive ground game. Grip fighting: Fast hand movement. This translates to fast hands in Boxing. Tachi-Waza: Fast hip movement and core strength. This translates to hip coordination required for kicking and good throws means a good clinch game and getting your opponent to the ground. Ne-Waza: Decent ground fighting. This translates into an increased progression level when learning Jiu-Jitsu. All of this translates into a good fighter in MMA competition. The talents gained while practicing Judo creates the will and body that is extremely conducive for MMA fighting. I will be outlining this in my next book Guerrilla Jiu-Jitsu II. I don't think this topic has been given proper analysis. Patrick Parker: How have the martial arts with which you've been involved changed over the course of your involvement? What does the future of these particular martial arts look like to you? Dave Camarillo: Jiu-Jitsu has grown since I started. It is huge. It has also had some growth in its professional appearance. Like I talked about earlier, an instructor does not own their students, the relationship has to be reciprocal. But in the case of JJ the growth is there, but it has a long way to go in that area. My first book talked about this type of Medieval behavior. I had a bad falling out with my former instructor and many have a similar experience. There are a large number of people who invest time and money in their arts only to be faced with an instructor who uses loyalty like dictators use the bludgeon. If you train with your friends, and they are from another academy, to the instructor, you have committed treason. It is just a weak control mechanism based on the students' inability to realize their options. These instructors do not want what is best for their students, they want what is best for themselves. That being said there is a movement that has naturally spawned out of this negative aspect of Jiu-Jitsu. And it is gaining momentum. With it comes some of the best instructors I have ever seen! Patrick Parker: I recently did an informal study of martial arts trends for my blog, and some of the results were pretty much as expected (UFC and MMA rising steadily with a peak around each big event) but some of the trends were somewhat surprising, like popularity of aikido dropping steadily. Do you have any ideas about what is happening here? Are traditional martial arts, like aikido and classical judo going to continue to decline as MMA continue to increase? David Camarillo: Yes. I read an article about top wrestlers leaving the sport prematurely because they can make a career out of MMA competition. MMA is a force and it is only getting bigger. It is hard for Judoka and others you mentioned to make a career out of their craft. There is also the cool factor. This has to do with our culture in this country. Martial Arts is very eastern. The West is driven more by entertainment in its culture. People like rockstars! And fighters are becoming the quintessential rockstars of our time. They are not on the level of Football or Basketball players but they soon will be. Remember, ego plays a large roll in our culture. We like the tough guy. And there is no greater aspect of entertainment that is creating the Ultimate Tough Guy than MMA or UFC competition. Dave Camarillo: I recently got a chance to train with the Great Marcelo Garcia. Besides him being the best Jiu-Jitsu fighter in the world I believe him to be a great Martial Artist because of his humble attitude. He is one of the nicest individuals I have ever met in our art. He invited me into his academy, trained with me and showed that the most accomplished can also be the most modest. I also just recently taught a seminar in King William, Virginia. And from that I got to see John Simons, Odyssey Martial Arts instructor, teaching his kids team. I was impressed with Simons not only in his ability to turn his kids into tough competitors, (the most accomplished in the country) but also in his ability to ingrain in them what it really means to be a Martial Artist: respect, honor and the ability to give to others. Thank you so much, Dave, for taking the time to do this interview with me. I have thoroughly enjoyed getting to talk about some of these issues with you and I know my readers will enjoy it. I am also looking forward to talking with you again after your next book comes out. I know that after getting to read some of your ideas in this interview, I can't wait to get my hands on it. I can certainly see why some of my readers called you the greatest martial artist they'd ever gotten to work out with. Fantastic interview. You guys covered a lot of ground! Pat, what a fantastic catch! Great insights into the art and current topics. "If you train with your friends, and they are from another academy, to the instructor, you have committed treason. It is just a weak control mechanism based on the students' inability to realize their options. These instructors do not want what is best for their students, they want what is best for themselves." This quote was great. I really just don't understand this attitude and it was great to hear Dave's take on it. I guess you have to be at his level to comfortably expose this kind of stuff. Question: so does what Dave is talking about in this quote impact belt promotions in BJJ? I notice that the belt promoions in BJJ are extremely subjective, and usually don't rely on belt tests. Wouldn't the teacher's perception of loyalty play a role?